Sister M. Joan Carroll, I.H.M. 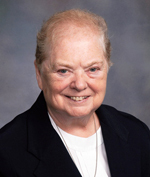 Sister M. Joan Carroll, I.H.M., formerly Sister Ronald Maureen, died Oct. 7 in Camilla Hall, Immaculata at age 80 and in the 62nd year of her religious life. Born in Norristown, she entered the Congregation of the Sisters, Servants of the Immaculate Heart of Mary in 1956 from St. Patrick Parish, Norristown and professed her vows in 1958. Sister Joan taught and was principal in elementary schools mainly in the Archdiocese of Philadelphia. She also served in the Diocese of Arlington in the early 1960s and in the Metuchen Diocese in the later 1960s. She served I.H.M. sisters as superior at Pacis Hall Convent before being assigned to Camilla Hall on Aug. 2, 2010 for her ministry in the Apostolate of Prayer. The funeral Mass was celebrated Oct. 11 at Camilla Hall, Immaculata. The principal celebrant and homilist was Msgr. Joseph Logrip; also concelebrating were Msgr. Richard T. Bolger and Fathers John Babowitch, Thomas J. Brennan, Martin E. Woodeshick and William E. Dean. In addition to her congregation, Sister Joan is survived by her sister Rosellen Smith. PREVIOUS: Sister Francis Loughran, 100, born in Ireland, served in Phila.